I Accepted the Ice Bucket Challenge. Will You? While the ice bucket challenge seems like all fun and games with adorable videos from Ben Affleck and Jennifer Garner and hilarious videos from Dave Grohl and the Foo Fighters, this is a very real cause. When it first started trickling around my corner of the internet, I wasn’t really sure what was going on, because I saw more negativity than anything else. People bashing it for not being a good campaign. Well…it’s a great campaign. You donate money to ALSA. Whether or not you dump a bucket of ice water over your head. You donate money. To a noble cause. This is raising awareness AND money. In my video, I challenged a few bloggers, but here, I am challenging you. Whether you choose to dump a bucket of ice water (or a bucket of water with about 8 ice cubes) over your head or not. I challenge you to go read about ALS (Lou Gehrig’s Disease). And donate if you have the means. By the way, I have fancy analytics in the back end of this here website, so I know if you’re clicking that link above. So click the link. 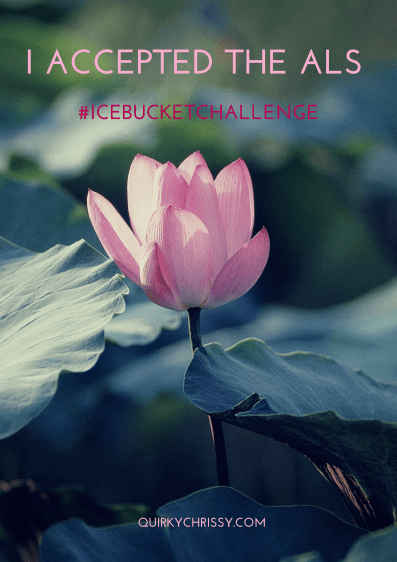 As I prepared for the challenge, I put ice into the bucket and started filling it with water. And it started getting soapy. So I had to dump it all out and try again. And again. Until there was no soap that would go in my eyes…And only a few pieces of ice. But I did it. As far as the sirens going off in the background…I didn’t do it. I swear. Have you accepted the ice bucket challenge yet? If you haven’t been challenged, consider this your challenge. Will you support ALS research?